The first running of the Boston Marathon was held on April 19th, 1897. The Boston Marathon is the oldest continually run marathon in the world. Katherine Switzer was the first female to register and run the race wearing an official race bib the following year in 1967. She used her initials on the race application since women still were not allowed to run marathons under AAU rules. 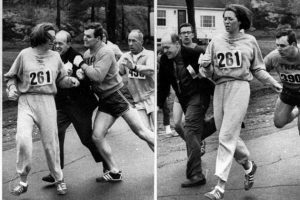 Jock Semple, the Boston Marathon race director tried to stop her during the race. The unsuccessful attempt by Semple was immortalized in this photo. 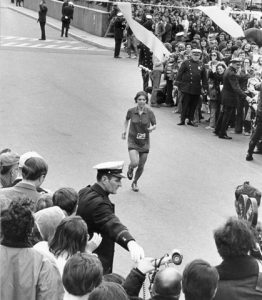 The first official female winner of the Boston Marathon was Nina Kuscsik (in 1972 after the AAU changed their rules that allowed women to officially register for the marathon. The Boston Marathon was the first marathon to have an official wheelchair division starting in 1975. This first repeat winners of the Boston Marathon were John “Jack” Coffery in 1900 and 1901. Roberta “Bobbi” Gibbs was the first unsanctioned female in 1966 and 1967 while Miki Gorman was the first official two-time Boston Marathon winner with marathon victories in 1974 and 1977. Joan Benoit Samuelson was the first marathoner to win an Olympic gold medal in the marathon (Los Angeles 1984) and the Boston Marathon (1979 and 1983).